Netflix has released released the official teaser for its upcoming animated children’s series, Beat Bugs. Watch it below. Featuring original characters from writer, director, and producer, Josh Wakely, Beat Bugs tells uplifting stories, featuring five mischievous friends: Jay, Kumi, Crick, Buzz, and Walter. Inspired by the songs of the Beatles, Beat Bugs features artists including Eddie Vedder, P!nk, James Bay, Sia, The Shins, Of Monsters and Men, Chris Cornell, Regina Spektor, James Corden, and Birdy, covering songs from the Lennon/McCartney “Northern Songs” catalogue. Featured songs include Help!, All You Need Is Love, Come Together, Penny Lane, Yellow Submarine, Lucy In the Sky with Diamonds, Sgt. Pepper’s Lonely Hearts Club Band, and Magical Mystery Tour. LOS ANGELES, Feb. 10, 2016 /PRNewswire/ — Netflix, Grace: A Storytelling Company (Grace), Thunderbird and Beyond Screen Production announced today that the highly anticipated children’s series BEAT BUGS will come to Netflix this summer. BEAT BUGS features original characters and a world created by Josh Wakely, who will direct, write and produce the series, following a deal with Sony/ATV Music Publishing for worldwide rights to record covers of the Beatles song catalogue for this production. Australian Netflix members will be able to enjoy the series on Netflix soon after its premier on Seven Network. BEAT BUGS incorporates songs from the Lennon/McCartney ‘Northern Songs’ catalogue, to tell uplifting and life-affirming stories filled with hope and melody. World-leading artists, animators and writers have come together to work on this extraordinary show. The Beat Bugs are charming, funny, adventurous, and have a knack for getting themselves into mischief and mayhem. Each of the five friends (Jay, Kumi, Crick, Buzz, and Walter) has a distinctive personality, and they display the charm and energy of five knockabout, lovable kids. They are best friends who band together to explore and learn in an overgrown suburban backyard, which to them is their entire universe. The show will feature some of the most well-known Beatles songs woven into the narrative of each episode, with Eddie Vedder, P!nk, James Bay, Sia, The Shins, Of Monsters and Men, Chris Cornell, Regina Spektor, James Corden, and Birdy each recording their rendition of an iconic song. Further artists joining the project are expected to be announced in the coming months. Among the songs featured include Help!, All You Need Is Love, Come Together, Penny Lane, Yellow Submarine, Lucy In the Sky with Diamonds, Sgt. Pepper’s Lonely Hearts Club Band, and Magical Mystery Tour. 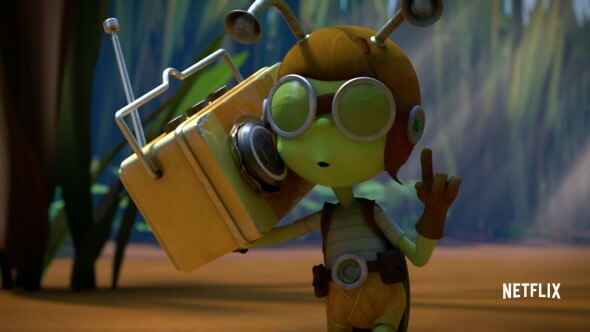 This marks the first project from Wakely’s independent film and television production and development banner, Grace: A Storytelling Company (Grace) – which he co-owns with BEAT BUGS Executive Producer, Trevor Roy. In addition, award-winning film and TV production group Thunderbird has come on board as a co-production partner, alongside Beyond Screen Production. Atomic Cartoons, a Thunderbird-owned studio, is working on animation for the series. The series is represented worldwide by Beyond Distribution. Netflix (NASDAQ: NFLX) is the world’s leading Internet television network with over 75 million members in over 190 countries enjoying more than 125 million hours of TV shows and movies per day, including original series, documentaries and feature films. Members can watch as much as they want, anytime, anywhere, on nearly any Internet-connected screen. Members can play, pause and resume watching, all without commercials or commitments. Grace is a global independent film and television development and production banner led by filmmaker Josh Wakely. Grace’s output is distinguished by innovation, and imaginative creative and business partnerships, combined to cultivate transformative storytelling. Based out of Australia and the US, Grace is committed to producing intelligent, elevated, talent-driven film and television projects to the worldwide audience. Thunderbird is a Vancouver-based TV and film production company with offices in Los Angeles, Toronto and London. Thunderbird produces award-winning programming for Canadian and International markets through its group of companies, which includes Vancouver-based Reunion Pictures, Great Pacific Media and Atomic Cartoons, UK-based theatrical distributor Soda Pictures, and a joint venture with Lionsgate, Sea to Sky Studios, which is dedicated to creating quality scripted content for the US and International market. Beyond International Limited (ASX:BYI) is a leading international producer and distributor of television and digital content and is one of the largest independent distributors of home entertainment product in Australia. The Company is headquartered in Sydney and listed on the Australian Stock Exchange. Beyond has produced over five thousand hours of television programs for broadcast internationally including Mythbusters, Taboo, Selling Houses Australia, Deadly Women and Facing Evil. The company has production offices in Sydney, San Francisco and Los Angeles and produces programs for Australian, US and international broadcasters. Beyond’s international distribution business markets an extensive program catalogue sourced from third party producers and internal production. This business unit is headquartered in Dublin, with sale offices in London and Sydney. The Home Entertainment operation focuses on digital and DVD distribution and has an extensive catalogue of product, which is distributed throughout Australia and New Zealand. The Digital Marketing business performs online search optimisation, website creation, development and performance and online media sales within Australia and New Zealand. What do you think? Do you like the sound of the Beat Bugs TV show. Do you plan to watch, when Beat Bugs drops to Netflix in August? More about: Beat Bugs, Beat Bugs: canceled or renewed?, Netflix TV shows: canceled or renewed?